Geek, cargo bike sensation, and food lover. Thijl Klerkx, 23 years old, born and raised in Amsterdam. Fifteen years ago I discovered my love for technology. Ten years ago I started to love entrepreneurship. Nowadays I combine my big loves as a founder of Dayli. My goal: making tasty, healthy food easy and affordable for everybody. Here you can learn more about my story. At elementary school my parents got their first computer with modem. All the sudden I could go online and see a livestream of elephants somewhere in Africa. Internet had magic to it. A little later I saw Ben Woldring on a dutch tv show, a thirteen year old who had made a website. This completed the magic: through the internet you could not only look at interesting stuff from around the world, you could also add to it yourself. You did not need money and your age did not matter. On the internet, anybody with a connection was the same. As a consultant I was working all the time and never cooked. I would eat out or order in every single day. It cost me a lot of money and gained me a lot of weight. That's how I came up with Dayli. A delivery service offering healthy and more varied food. Of course with quick delivery and a low price. Dayli makes it possible to order in every day and still eat healthy, tasty, and affordable. At the end of 2016 I gave up my comfortable life and high income, invested all of my personal savings, and founded Dayli. The app can be downloaded through the app stores and Eatdayli.co. The app offers you a choice of three healthy meals each day, meals are €10 only and are delivered warm, within 20 minutes. After stopping Thijl.nl my mentor and retail guru Roel van den Berg introduced me to the world of big international companies. Several big corporations from around the world invited me to work on their future in a digital world. This was an ideal way to combine saving money, traveling, and learning more about the world of big business, innovation, and technology. Among others I had the pleasure to work for Corio, KLM, Randstad, SNS, and Bavaria. Thijl.nl had become profitable and my turnover kept growing, but I did not see enough progress. To grow into a real business I needed serious investments. I had made my way through high school and surely didn't want to spend more time at school, but I did not really have a plan ready to grow Thijl.nl into a fulltime business. I made the hard decision to stop Thijl.nl At this point I could not grow it the way I wanted and decided to focus on something new. You'd almost forget that next to being an entrepreneur I still had to go to school. It was hard to stay focused with the exciting stuff going on in the world of business. After six years on Het 4e Gymnasium I got kicked off because of my bad results. I continued on het Joke Smit College where I was offered more flexible classes. This way after eight years I finally managed to receive my vwo diploma. 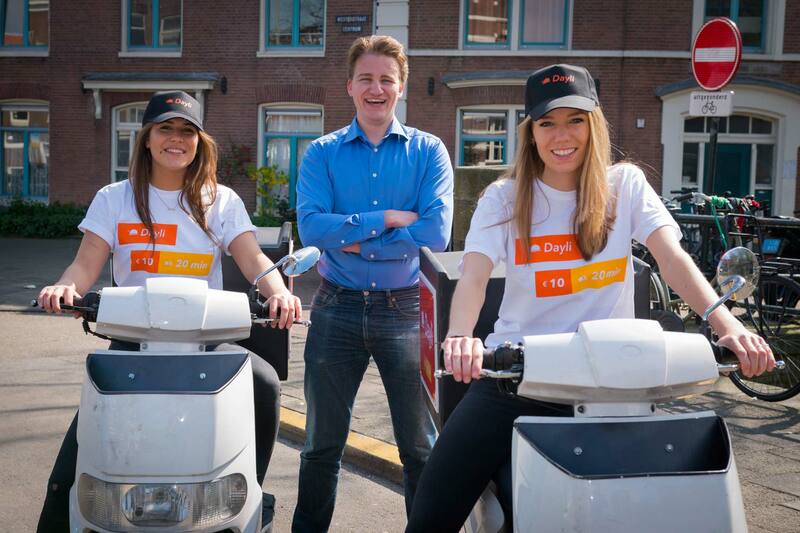 After two years of preparation I launched Thijl.nl on April the 15th, 2010. This was not an instant success. I had been working on this for two years but the real workd had only just started. Step by step I managed to grow my customer base and maken Thijl.nl a small but profitable company. When I decided to hire someone to do deliveries during office hours (read: school hours) business got even better. I soon added some really cool companies to my customer base. No matter how enthusiastic I was about the concept of my delivery service, I did not have enough capital and experience to start such a complex business on my own. When I saw entrepreneur and investor Annemarie van Gaal on tv I decided to e-mail her. I didn't really expect any response but I could not have been more wrong. Within two hours I received an invitation to meet Annemarie at her office. In the following years Annemarie coached me and invested in my company. At this stage, an experienced individual offering such unconditional trust and support is just invaluable. After the sale of Ditix Webhosting it was time to go to high school. Business ideas kept coming and soon I couldn't wait to stop my job as paperboy and start a business. When I heard about Freshdirect.com, an American business delivering fresh food, meals, and snacks of high quality I immediately got intrigued. Delivery services for groceries were around, but they did not sell organic food at that time. This is how the idea for Thijl.nl was born. After six months in business we sold our company for €420. Too much work on top of the final year in elementary school. A week later the first iPod video was launched and gone were my earnings. Through books and the internet I learned to build websites in HTML, CSS, PHP, and MySQL. I used the free webhosting from Planet Internet to publish them. Every weekend I would work hard on my website. In the evening, when dialing into the internet was cheaper, I would upload my new version. When I started building websites for others the Thijl Louis Klerkx Site Service (TLKSS) was born. Enter your email address and I'll keep you posted! I wont email you more than once a month and you can always unsubscribe.